New York City’s hottest rising disc jockey Cory Giles is leveling up with the follow up to his debut mix “Hi My Name Is”. The most recent mix is a part of the Hi My Name Is… collection. “Hello My Name Is” features music by Dj Khaled, Kendrick Lamar,Calvin Harris, Major Lazor, Snoop Dogg, Jay Z, 50 Cent, The Diplomats and The Rolling Stones, making it a combination of classics, new joints, indie and unsigned artists. Cory really leveled up with this one. His Hi My Name Is 2: The Level Up provides great upbeat vibes just in time for the summer. The video game inspired mix includes swift transitions using a variety of skits and Mario Brothers video game scores. Following the Mario brothers intro, Cory kicks off the mix with some Drake, The Carters, Jaden Smith, Migos, Nas, Pusha T, Miguel, Fabolous, Ty Dolla $ign, Jeremiah, and more. The self-taught dj blends street essence and soulful vibes mixing together a variety of genres such as Hip-Hop/R&B, Rap, POP, Reggaeton, & more. ‘HMNI 2’ is currently charted in the Hip Hop, R&B, Indie & Chillout categories on Mix Cloud. Take a listen below, I promise you will not be disappointed! Really feeling a record and want to know what it’s called and who sings it? 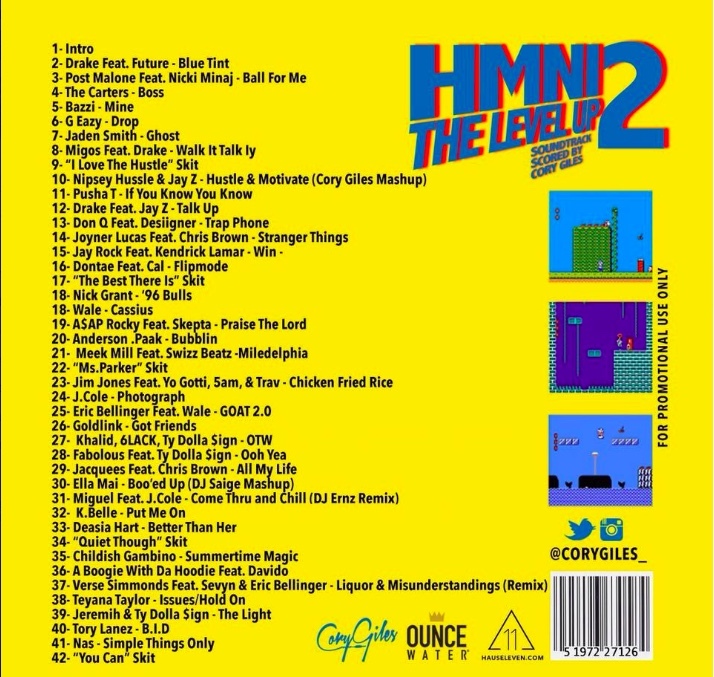 Check out the ‘HMNI 2’ tracklist below.